In a fit of fiscal responsibility, the Rileys have decided to make a pot of chili while staying at a cabin in the mountains instead of going out to eat for dinner. Simple plan, right? Totally! In fact, it’s so simple, we have compiled a list of the steps we followed to make a pot of chili while on vacation. Read and learn, young grasshoppers. Read and learn. Step 1. Initiate cheerful discussion of dinner possibilities. Step 2. Husband suggests “big ol’ pot of chili” for dinner. Step 3. 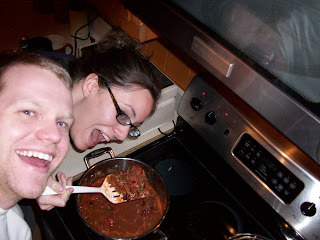 Wife pulls a super mature grossed-out face and challenges the health benefits of suggested chili. Minor argument ensues over merits of protein vs. saturated fat content in chili. Step 4. Compromise is reached in the form of Cooking Light chili recipe. Step 6. Husband and wife get in car and drive five minutes to grocery store. Within two minutes of being in store, husband picks up one yellow onion and approximately twenty of them cascade to the floor. Wife cannot help husband because she is laughing too hard. Step 7. Locate remaining ingredients… except wine. Wine is important part of chili recipe. Scour entire store for wine section. Step 8. Remember cabin is located in dry county. Nearest wine available for purchase is ten miles down the mountain. Wife decides it’s best to improvise with tomato sauce or similar as opposed to driving twenty miles round trip for wine. Husband insists on keeping integrity of recipe and claims it’s “not that far” to the next town. Step 10. Wife, once again showcasing a mature and classy attitude, spends next five minutes pointing out that she has been coming up to this cabin for at least ten years and knows how long it is from town to town, and this is at least the fourth time she’s been right about something since the beginning of the year. Step 11. Husband does not concur. Step 12. Twenty minutes later, reach alcohol-friendly town. Drive to small, independent grocery store, only to see CLOSED sign on door. Step 13. Drive to wine and cigar store. Another CLOSED sign. Cue delirious giggling. Step 14. Remember gas station passed on road. Enter gas station and immediately shrink away from stares of “regulars” sitting at slot machines in corner. There is no wine to be found. Man with mop tells us to go to Farmer’s Market. Step 15. Locate Farmer’s Market. Locate wine. Purchase wine. Get back in car and drive ten miles back to cabin. Step 16. Assemble ingredients on counter. Wife begins search for cutting boards. Spends ten minutes looking in every cabinet and drawer for cutting boards. Finally locates several brightly colored cutting boards hiding in plain sight on counter. Step 17. Start cutting vegetables. Wife slices thumb open while chopping jalapeno. Husband takes over chopping duties. Wife attempts electric can opener. Fails. Husband takes over can opening duties as well as chopping duties. Step 18. Wife is incapacitated by onion fumes and has to leave kitchen. Husband is inexplicably unaffected. Step 19. Throw all ingredients in large pot and set on stove. Realize chili needs one hour to simmer. Step 20. Cry because it is 8:45 and we are still waiting on our chili. Despite the great Chili Disaster of 2010, we had a great time on our little adventure tonight. We’re having a lot of fun up here in the mountains. Hope you’re having a great week, too! You guys are cracking me up! Enjoy your vaca in Cashiers! "Wife begins search for cutting boards. Spends ten minutes looking in every cabinet and drawer for cutting boards. Finally locates several brightly colored cutting boards hiding in plain sight on counter." That would be me – LOL! I am so freaking hungry right now…(tongue lolling from the side of one's mouth Homer Simpson style). Too funny! You've gotta love those small towns. Sounds like you're having a great time. Enjoy the mountains and the chili!